Includes Round Door Hanging Die Cut! Introduce yourself to customers at their front door when you buy door hanger printing from PGprint. Our door hanger printing is effective for your marketing needs at a low-cost. Stretch your advertising dollar to the max with door hanger printing. Advertise for pennies on the dollar. Get the maximum benefit at minimum cost when you hire PGprint for cheap door hanger printing. Because it’s cost effective doesn’t have to mean it’s low quality. Our door hanger printing is quality printing that can’t be beat. 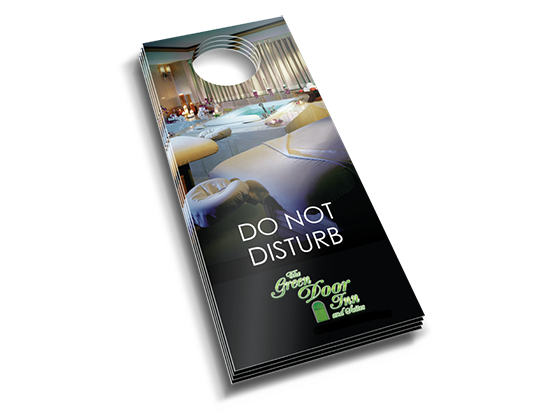 There is a high-impact way to get the word out about your product, service and company when you use door hanger printing.